This quick pillow utilizes Kim Andersson’s new Tidal Lace fabric collection for Windham Fabrics. It’s a great beginner project or a quick gift for someone special. Here is the skinny . . .
Cut 21″-long strips of fabric in various widths. I used the earthy tones in the collection near the bottom of the pillow top, watery fabrics in the center part and the airy colors near the top. 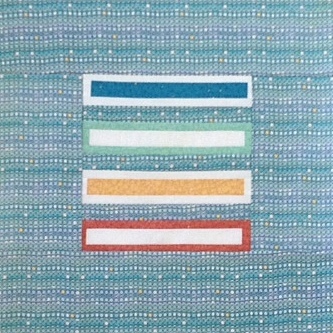 Join enough strips to form a square 21″ x 21″. TIP: Adding a narrow strip or two creates drama. In this picture, you can see light blue and light pink strips. Each of these narrow strips was cut 3/4″ x 21″. Then I sewed them using a 1/4″ seam allowance, so they finish 1/4″ wide. Cut a piece of muslin 24″ x 24″ and a piece of batting 24″ x 24″. Place the batting on top of the muslin, then center the stripped pillow top with right side facing up, on the batting. Hand baste the 3 layers together using random 2″-long stitches to hold the layers together. You can pin baste the layers, but I think hand basting holds them in place better. With a small project like this, hand basting will only take a few minutes. Quilt the pillow top sandwich in long wavy lines from one side of the square to the other. 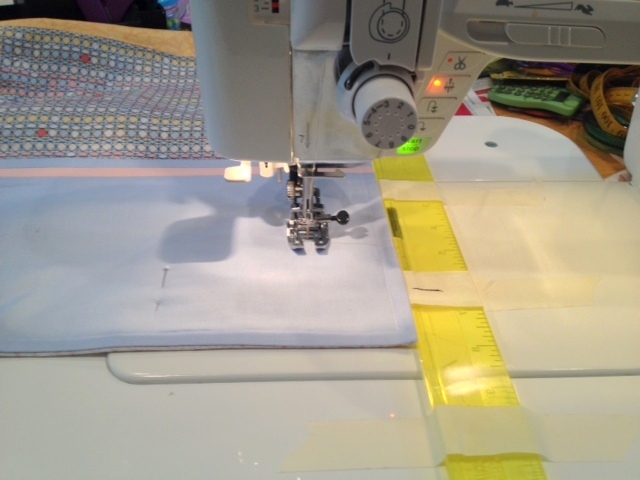 I used a walking foot and gently moved the fabric from side to side as the machine sewed. My wavy lines were more wavy at the bottom of the pillow top and more straight near the top. Quilt the heck out of it. I am not a proficient machine quilter, but this was a piece of cake and added great texture to the pillow. Quilt the pillow top by crisscrossing rippled lines of stitches. Trim the muslin and backing even with the quilt top. Make sure the pillow top sandwich is square and measures about 21″ x 21″. Set aside for now. On each back panel, turn one 21″ edge under 1/2″ and press. Turn this same edge of each panel under 2″ and press. Topstitch the pressed edge of each panel to hold the folds in place. Overlap the folded edge of one back panel over the folded edge of the other panel by about 4″ and pin together. The pinned pieces should form a square about 21″ x 21″. If you need to, adjust the overlap to get this measurement. Machine baste across the top and bottom of the back, where the panels overlap. Place the pillow back right side up on your table. 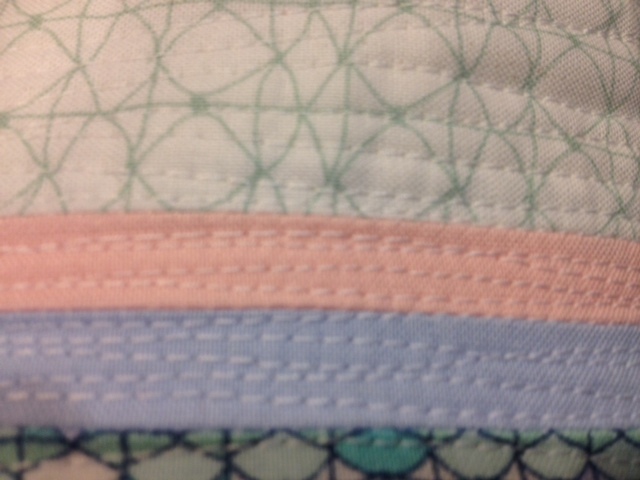 Put the quilted pillow front face down on the pillow back, so the pillow front and back are right sides together. Pin and stitch all four sides using a 1/2″ seam allowance. Turn the pillow cover right side out and press the outer seams and corners. If everything looks hunky-dory, turn it inside out again and trim the outer seam allowance to a scant 1/4″. I always like to make sure everything looks good on the outside before I trim a seam! Turn right side out and press one last time. You can insert a 20″ x 20″ pillow form now and your done – congrats! IF you want to create a flange around the outer edge of the pillow, read on . 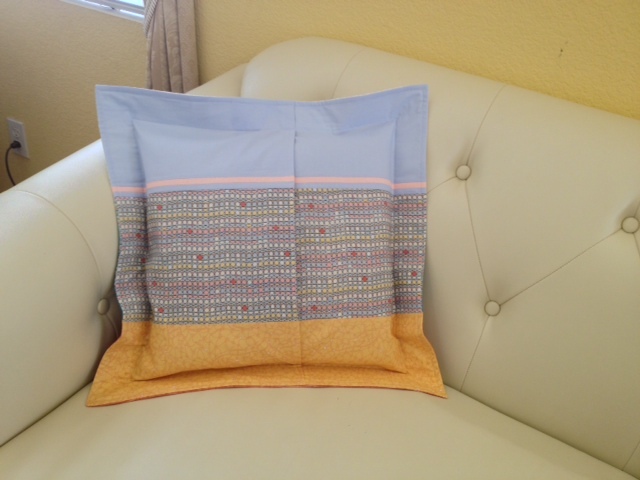 . .
A 2″ seam is sewn around the outside of the finished pillow to create a flange. Then a smaller, 16″ x 16″ pillow form is inserted. This photo of the pillow back shows the flange well. To create this outer flap, begin by topstitching 1/4″ from the edge of the pressed pillow cover. 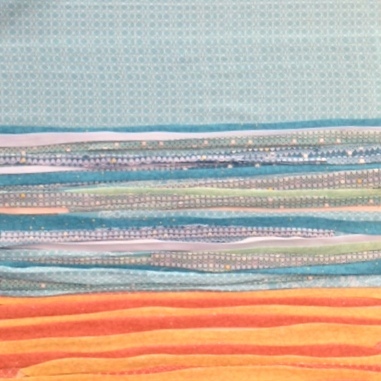 Sew another row of stitches 2″ from the outer edges of the pillow cover. I taped a ruler to the bed of my sewing machine 2″ from the needle. See my previous post on Wide Seams for a more detailed explanation. This really helped me sew a straight line! That’s all there is to creating a “flange”! Insert a 16″ x 16″ pillow form through the opening in the back and take pictures! Here are a couple other ideas I had while playing with Kim Andersson’s Tidal Lace fabrics. This awesome fabric collection will make its appearance at your local quilt shop in January ’15. For a modern looking pillow, I started with simple rectangles and added narrow strips around each. Then I used a great Tidal Lace print to fill in the rest of the pillow top. 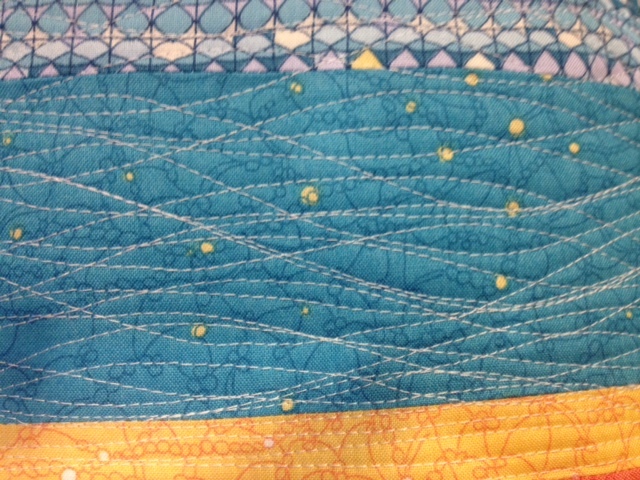 I will add simple channels of stitches when quilting this pillow top. Another idea I was toying with was to add wavy bias strips of fabric to a simple strip-pieced background. These bias strips haven’t been sewn down yet, but you can see the “painterly” effect that can be achieved. Pillows are a great way to try new ideas while creating a nice finished piece. Have fun! This entry was posted in fabric, free quilt stuff, Pattern, Pillow, Quick project, quilt, quilt tips, sewing, Uncategorized and tagged free tutorial, Kim Andersson, Pillow tutorial, sewing project, Tidal Lace, Wyndham Fabrics. I LOVE this fabric, and I LOVE your pillow! I wish my house was more “beachy”. Maybe I could do it for my daughter???? Love the pillow and the fabric. Love everything you have designed. Congrats! I love the colors in the collection and details on the Tidal Lace pillow tutorial. This would make a perfect gift for someone I know. Thanks for the tutorial. Thanks for the tutorial. I didn’t know how to do a flange before. Pretty pillow, love the quilting. Your pillow is gorgeous! I love the way you use the colors! 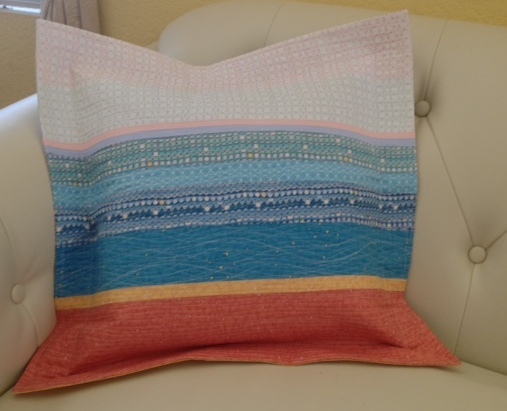 This is such a lovely pillow project. It is beautiful for the color effect you have achieved, and the lovely flowing sides. Great tutorial. I really like your wavy quilting. It looks so neat with the fabric. I really like your pillow, it reminds me of standing on a beach looking out to sea. Beautiful pillow – and beautiful fabric collection! Sweet pillows and a great gift idea!! 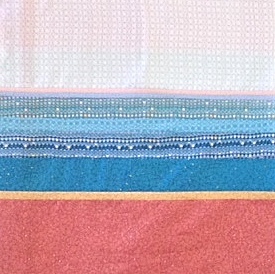 I love the colours in Tidal Lace fabric line… So pretty!! Wow, these are really beautiful, love the colors. You are right, it’s all about Kim’s wonderful fabric! Pretty pillow, beautiful fabric collection. What makes a quilt shop fun? See what I'm posting on Flickr . . .
Quilter. Crafter. Lover of all things handmade. Powered by chocolate milk. Home of the animal quilts. Life (like my quilting) is slightly off kilter.